This was the lineup of our farm tractors about 30 years ago. Notice that every regular tractor was RED (International Harvester Red), with only the one green John Deere. The light green 4-wheel drive tractors were Steigers which eventually were purchased by IH and now the Steiger brand all proudly display red paint! The two tractors with the yellow tanks were the tractors we used to plant our corn and soybean seeds with. These yellow tanks held the herbicide solution that we applied at planting to control weeds. 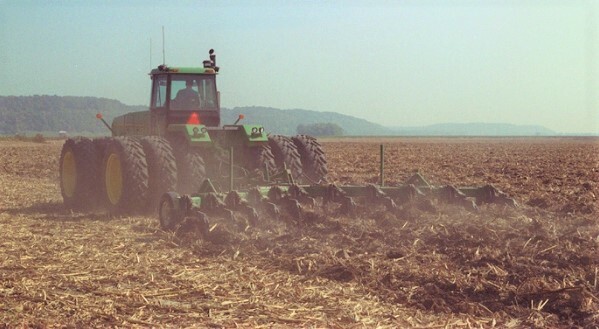 The 4-wheel drive tractors did the primary tillage which requires high horsepower to deep till the soil and secondary tillage which involves very wide shallow seedbed preparation equipment. The 2-wheel drive tractors were for crop care such as planting, spraying and cultivating for weeds, mowing and powering augers. The Steiger on the left has a 360 horsepower Cummins engine and is attached to a 47.5 feet wide field cultivator which prepares a seedbed for planting. The center Steiger has a 325 hp Caterpillar engine and is connected to another cultivator. The Steiger on the right is hooked to a disk and is a 310 hp Cummins. 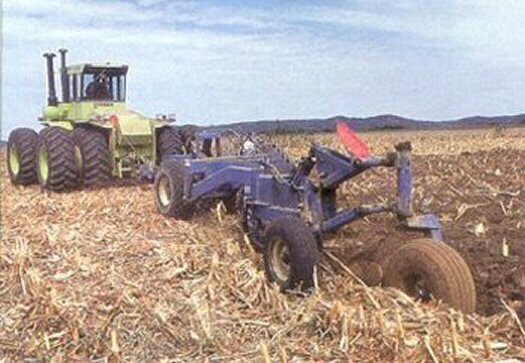 Primary tillage with a V-ripper. Primary tillage with a moldboard plow...350 hp and a 10-bottom DMI variable width plow. BIG...BAD...and RED . In 1989 we added this International Harvestor (Steiger) 9180. It was our first tractor with "triples". It also had a Cummins engine with 375 horsepower and a powershift transmission.